Dal Makhani is a rich, creamy and luscious dish. It’s a popular North Indian food and the people here love their Dal Makhani just the way they fall for Rajma-Chawal and Chole-Bhature. Perfecting the Dal Makhani was never been easy for me. I tried cooking it by following different recipes, tasted dal makhani from many eateries to understand what goes into it, where my recipe is lacking the actual taste, etc. The process was long. Some food doesn’t taste authentic (though ‘authentic’ is a very clichéd word, still only this word will do the justice here) if the harmony between spices and cooking time is missing. The thumb rule of Dal Makhani is slow cooking. The longer you simmer the dal, more will be the taste. Dal Makhani can taste like Dal Fry if not done properly, I’m not making you afraid of trying this. I’m just stating my experience. After several try now I can say that I cook a decent restaurant style Dal Makhani at home. My recipe is an adaptation of this recipe. Soak urad dal and rajma in plenty of water overnight. Next day discard the water and wash 3-4 times under running water. Next to pressure cook with enough water (water level should be 2″ high from dal), 1/2 tsp salt and green chilies. Check after 7-8 whistles. You need to cook the dal with the grains visible and mushy at the same time. Open the lid after the pressure has reduced. Dry roast Kasuri Methi on medium heat for a few seconds, let it be cooled. Grind into a fine powder using your mortar pestle. Keep aside. Heat butter in a deep frying pan/kadai. Temper with all the ingredients mentioned ‘for tempering’. Add chopped onion, sauté until light brown in colour. Next to add ginger-garlic paste, turmeric powder, coriander powder and kashmiri mirch powder. Mix and stir for 10-12 seconds. Add tomato puree, stir for a few seconds more. All this on medium heat. Now add boiled dal and salt. Add ½ cup of water into this. Mix well, cover and cook on low heat for next 30 minutes. 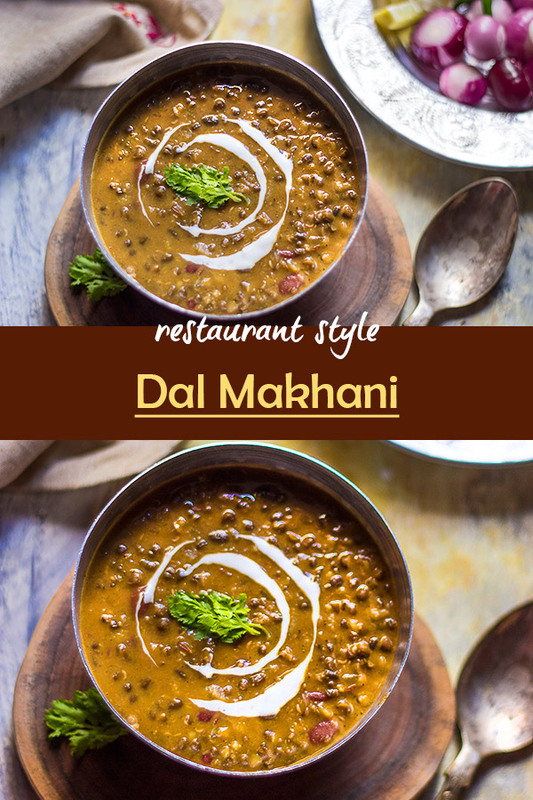 This slow cooking is very important to bring out the real taste of Dal Makhani. Keep stirring in between, and adjust water if you think that the dal is thickening too much. Add fresh cream, mix very well. Next to add powdered kasuri methi, nutmeg powder, and garam masala powder. Mix well, garnish with coriander leaves and fresh cream. Serve Dal Makhani hot with Roti, Naan, Paratha, Phulka or steamed rice. Enjoy! 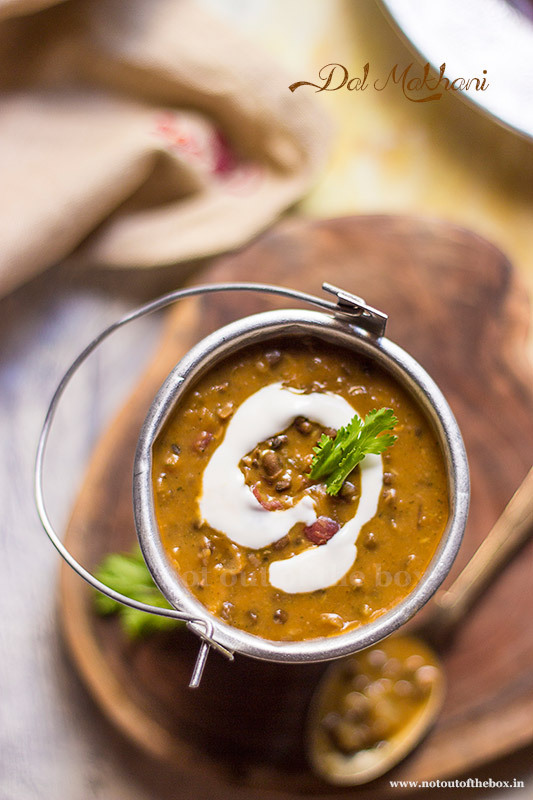 Dal Makhani is a rich, creamy and luscious lentil based main course dish. It’s a popular North Indian food and paired best with Naan or Tandoori roti. Heat butter in a deep frying pan/kadai. Temper with all the ingredients mentioned ‘for tempering’. Add chopped onion, sauté until light brown in colour. Next to add ginger-garlic paste, turmeric powder, coriander powder and kashmiri mirch powder. Mix and stir for 10-12 seconds. Add tomato puree, stir for a few seconds more. All this on medium heat. Now add boiled dal and salt. Add ½ cup of water into this. Mix well, cover and cook on low heat for next 30 minutes. 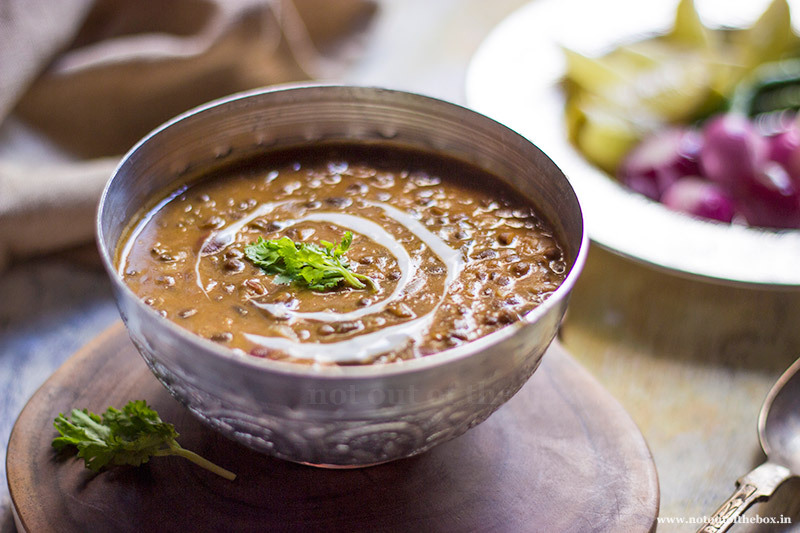 This slow cooking is very important to bring out the real taste of Dal Makhani. Keep stirring in between, and adjust water if you think that the dal is thickening too much.